In a small bowl, combine the brown sugar, smoked paprika, chili powder, pepper, salt, garlic powder, onion powder and cayenne pepper. 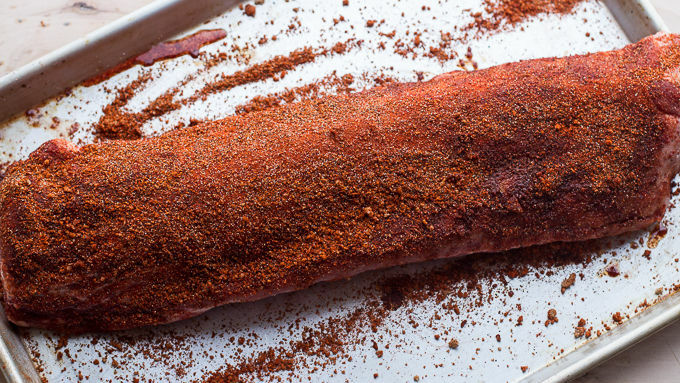 Lay the ribs flat on a baking sheet and rub them evenly with the spice mixture. Wrap each rack of ribs tightly in foil and place on the grill for 1 hour to 1 hour and 30 minutes or until the ribs are tender. Meanwhile, add the olive oil to a skillet set over medium-high heat. Add the peaches and sauté until soft and caramelized, about five minutes. Remove from the heat and add the bourbon. Allow the peaches to cool slightly and then add the BBQ sauce, chipotle chilies and adobo sauce, and honey to a food processor or blender. Puree until smooth. If the sauce is too thick add water to thin. Taste and adjust your liking. Reserve some sauce for serving later with finished ribs, if desired. Remove the ribs from the grill and remove the foil. 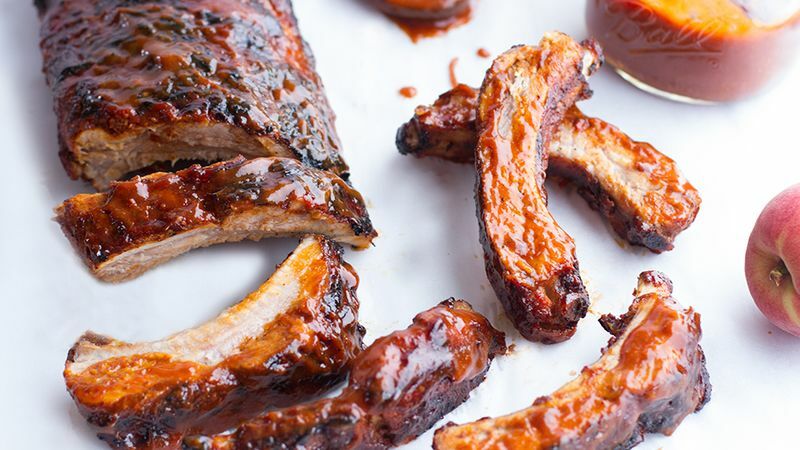 Brush the ribs with the sauce and place back on the grill until the ribs are lightly charred, about 5 minutes per side. Serve the ribs with the reserved sauce. The ribs can also be baked in the oven at 300°F for 2-3 hours and then grilled with the sauce as directed. 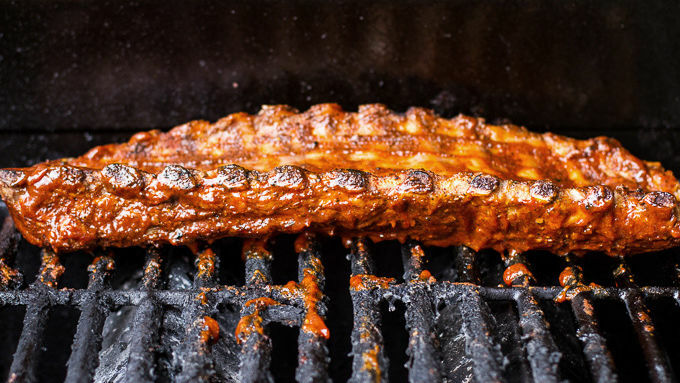 Sweet heat is a beautiful thing on a rack of grilled ribs. So I made us some ribs! And you guys, these ribs? 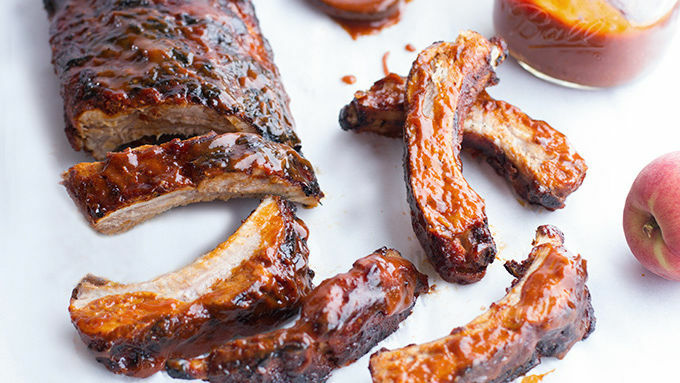 These ribs are all about the sauce. It’s a chipotle peach BBQ sauce and it's out-of-this-world good. I am a huge fan of the sweet and spicy flavors, and anything involving peaches is almost always a winner in my book. Plus, it’s summer and what’s better than ribs, BBQ and peaches during these hot months? Pretty much all you need to complete this picture is a large ice cream cone to finish things off. A perfect summer meal! Anyway, these ribs are really quick and simple. You don’t even need the oven, and the sauce has only six ingredients. The ribs can also be baked in the oven at 300°F for 2-3 hours and then grilled with the sauce as directed. Serve the ribs with the reserved sauce. Prepare to get messy, then dig in!